There are many reasons people become homeless, and the combination of factors that lead to homelessness are different for every individual. Some of the factors that contribute to homelessness for youth, single adults, and families in their community are described here. This knowledge has been used by the Committee to End Homelessness in King County and its subcommittees to identify the key areas of focus in their efforts to address homelessness through the Ten-Year Plan and the annual CEH work plans. It is difficult, if not impossible, for low-income individuals and families to find affordable housing in King County. Less than one percent of apartments in King County are affordable to households earning less than 30 percent of median income ($25,700 for a family of four). The average rent plus utilities for a two-bedroom unit in King County is $975; in Seattle it is $1,120 and in Bellevue it is $1,502 and in south King County it is $855. A worker must earn over $17-21 per hour to afford this housing, making it out of reach for many of the areas working poor families. A Supplemental Security Income (SSI) recipient receiving $603 per month can afford monthly rent of less than $200, yet the average rate for a one-bedroom unit is $812 in King County. In a two-week period in April 2008, the Seattle Housing Authority received nearly 12,000 applications for their Section 8 Housing Voucher wait list. Poverty is closely linked to homelessness. When people lack income to meet all of their needs, they are forced to choose between housing, utilities, transportation, childcare, healthcare, and food. One quarter of the homeless individuals surveyed as part of the One Night Count were employed. Nationally, a similarly high proportion of homeless individuals are employed. However, wages are often not sufficient to ensure housing stability and many people do not have jobs that provide living wages, health insurance, or high job security. Half of homeless adults have incomes of less than $300 per month. A lack of educational opportunities limits access to living-wage jobs. Research has shown the lack of a high school diploma to be associated with homelessness for individuals and families. Domestic violence is a factor in homelessness, particularly for women with children. Nationally, studies indicate that up to half of homeless women with children may have experienced domestic violence prior to becoming homeless. Many youth and young adults who are homeless have experienced violence in their homes. In 2007, of the over 7,000 people counted in the One Night Count, more than 1,000 cited domestic violence as a significant factor of their homelessness. 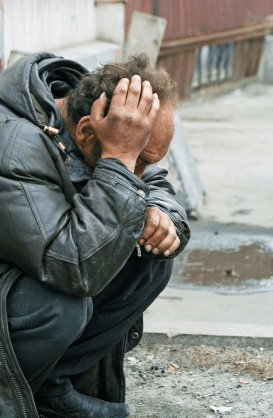 People who have complex life issues related to mental illness and substance use are seen in higher numbers among homeless persons than the general population. Nationally, between 20 and 25 percent of homeless persons are living with a severe mental illness. While information about addiction is less definitive, alcohol and drug use is also noted among a large number of homeless persons. Untreated mental illness and substance use issues clearly affect housing stability and success. Too often, people are released from jails, prisons, or hospitals without sufficient reentry planning to ensure housing stability and success after discharge. For those who had been homeless prior to institutionalization, housing stability may be even more difficult to achieve. People with histories of incarceration face particular challenges in accessing and maintaining housing post-release as there are few housing options targeting this population and there is resistance in many neighborhoods. In addition, many who are exiting institutions and systems of care need a wide range of support services to successfully transition into the community, including healthcare, mental health services, chemical dependency treatment, life skills development, and job training, and the availability of these services is decreasing. Legal barriers can lead to homelessness or the inability to secure permanent housing. Prior felony convictions, outstanding warrants, and lack of proper documentation are barriers to accessing many subsidized housing programs, which are key supports for low-income persons. Vagrancy ordinances create legal problems for homeless persons. In addition to personal legal barriers, land use and zoning regulations and community opposition can be significant barriers to affordable and supportive housing development. For many low-income and disabled persons in the United States, the cost of healthcare is a significant economic barrier to housing. Although some homeless people with disabilities are eligible for health coverage through Medicaid or Medicare, the application period can range from a few months to a few years and the system can be confusing for homeless persons and providers to navigate. Low-income people often have difficulty affording the co-pays required by care providers. Many homeless individuals utilize emergency rooms to address health issues that have elevated in seriousness due to lack of preventative care. Homeless persons have high rates of both chronic and acute health problems. People of color are significantly over-represented in the homeless population. While people of color comprise approximately 27 percent of the general population in King County, they represent 57 percent of people who are homeless. In Seattle, the median income for households comprised of people of color is significantly lower than for white households, and people of color represent a disproportionate share of low-income city residents. Homeownership rates also vary by race/ethnicity, and are lower than average for every racial and ethnic minority. In King County, children of color make up one-third of all children but more than half of children in foster care. A Native American child is five times as likely as a white child to be placed in foster care or remain in care longer than two years. Children and youth who have been placed in foster care are more likely to experience homelessness as adults, and it is estimated that one third of all homeless parents spent some part of their childhood in foster care. All of the problems listed above are exacerbated when individuals and families lack a network of social support. Many people experience difficulties in their life. For most people, families, churches, neighborhoods and schools operate as webs of support that sustain them until the problem is overcome. For some, however, those supports are no longer available - because they have fled their community to escape domestic violence, have been rejected by their parents over lifestyle differences, because they have "burned through" their support systems due to multiple difficulties or for many other reasons. For those without support, a single crisis such as a sick child with no daycare or the breakdown of a car can lead to loss of employment, financial crisis and homelessness, and without that community support, the path back out of homelessness is vastly more difficult. The Washington Association of Sheriffs and Police Chiefs and the National Alliance for the Mentally Ill held a summit to discuss mentally ill and chemically dependent offenders. It's the first time they've had this kind of collaboration between the criminal justice and mental health systems in this state. Through this kind of collaboration they are creating a more effective criminal justice system and a safer community. Addressing homelessness is important because it is a bellwether for their society. It tells us if their education system is working, their criminal justice system is working, their physical and mental health systems are working, and whether they are providing their community members the support and opportunities they need.